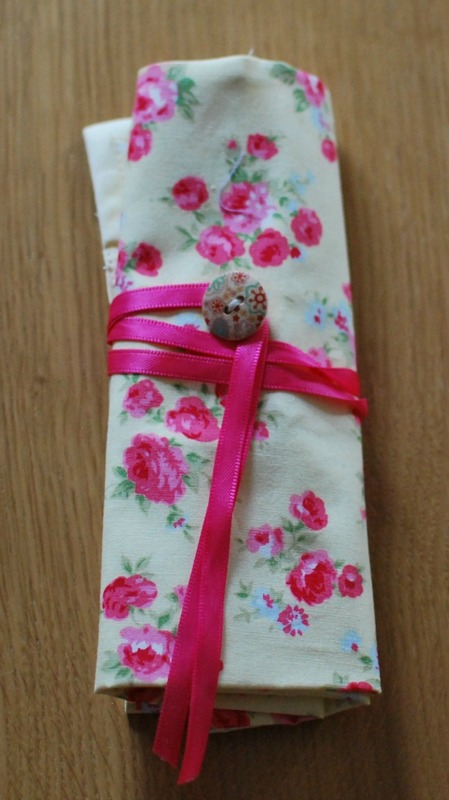 Are you looking for something special for a Mothers Day Gift? This would also be perfect for a birthday or Christmas present. If you can sew a straight line then this is an easy and perfect gift for anyone who loves to crochet. My daughter in law loves to crochet and she bought herself some fabric, buttons and lace from The Works. It was not at all expensive. 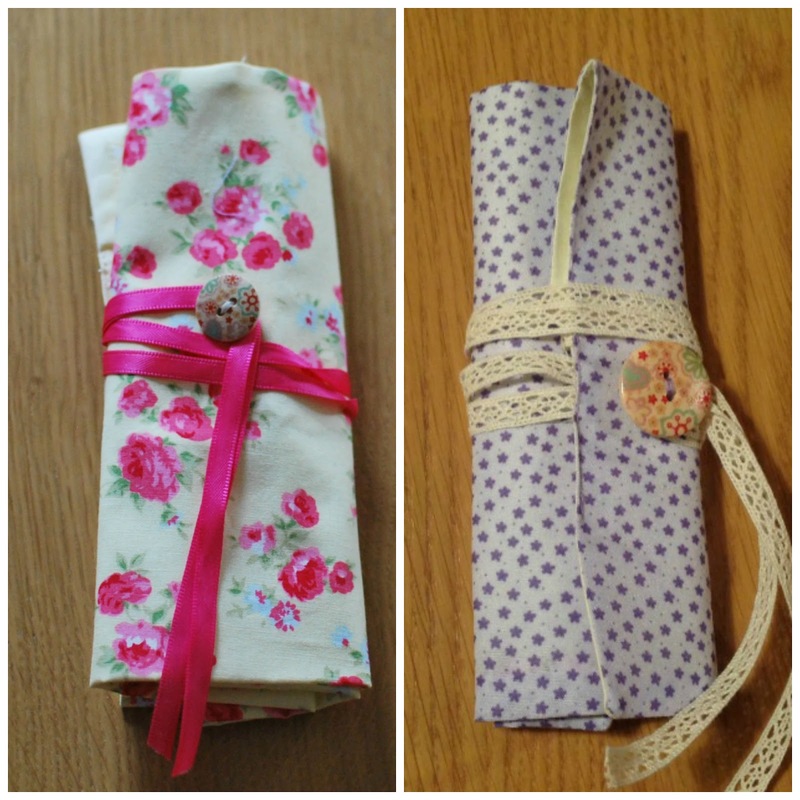 With a sketch from her and my notes when I made myself a knitting needle roll I made a crochet hook roll. 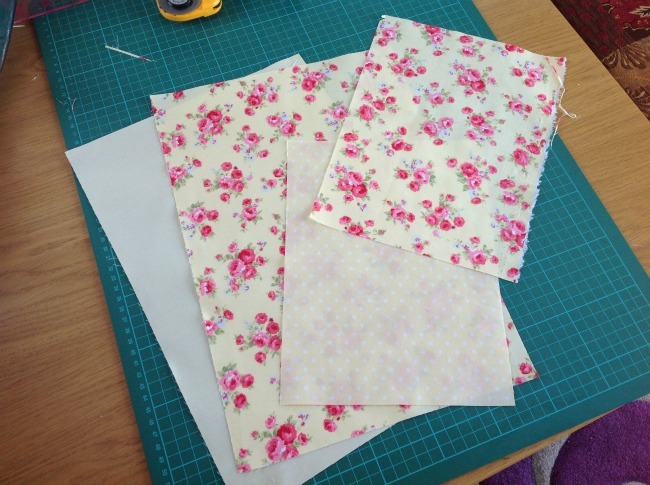 I practised with some Rosalind Rose fat quarters from Higgs and Higgs . 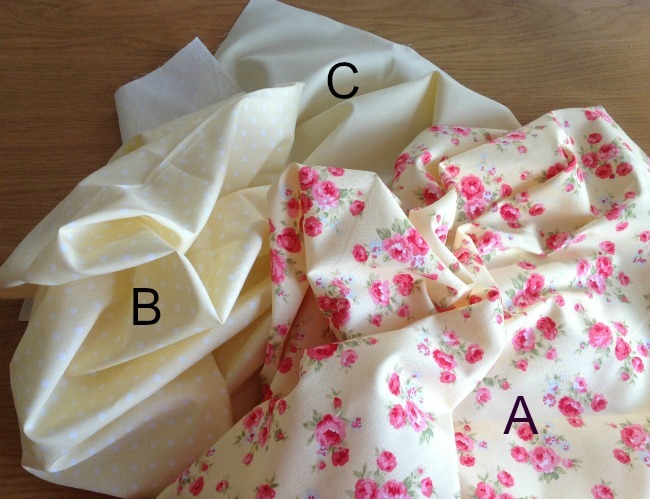 A stunningly beautiful floral, with a complimentary polka dot and a plain lemon cotton. I just love their fabrics. After I did my practice run I changed the pattern slightly and made my daughter in laws. Both are just so practical and pretty. The amount of fabric needed is small. 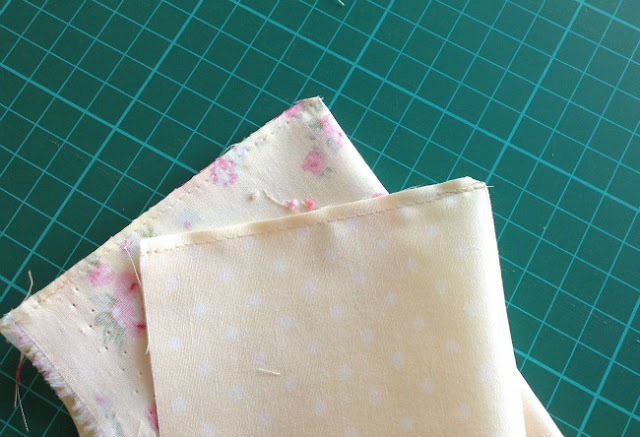 It could be cut from your favourite remnants or even from clothing no longer worn, maybe a skirt or blouse. This roll has slots for crochet hooks and a pair of scissors. 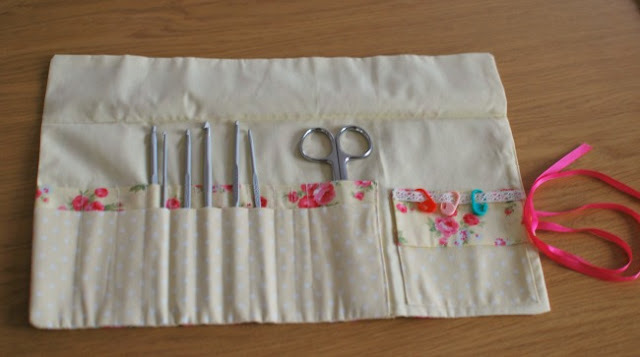 It has a little pocket for needles and a ribbon to hang stitch/row markers. The completed size is approx 6½" high and 13½" long. 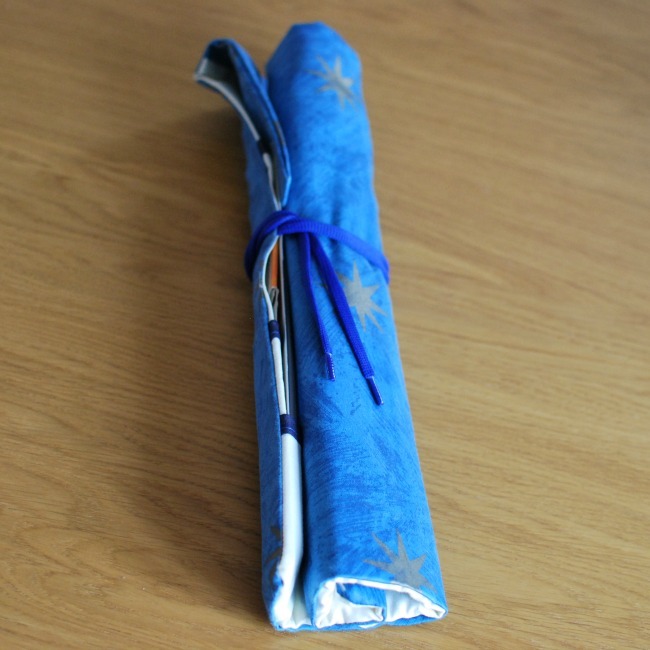 When rolled it is approx 2½" wide, depending on how many hooks you squeeze in! 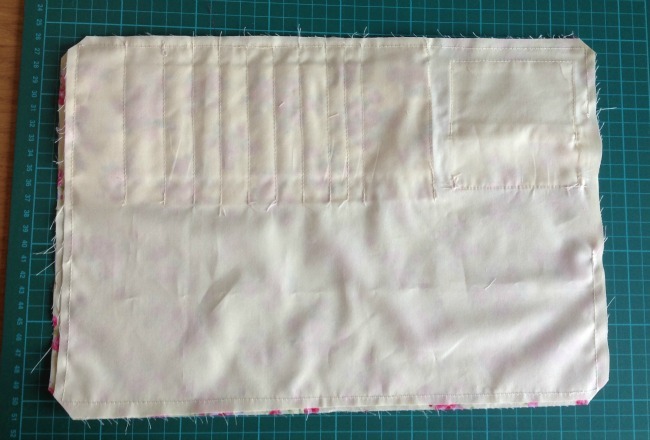 Press fabric and cut the following rectangles. Turn right sides out and press. Push corner out with something pointy like a knitting needle. Take piece A3, the pocket flap, fold in half right sides together and sew around the edge leaving a gap on one long side. Press flat turning under raw edge so that it looks neat. 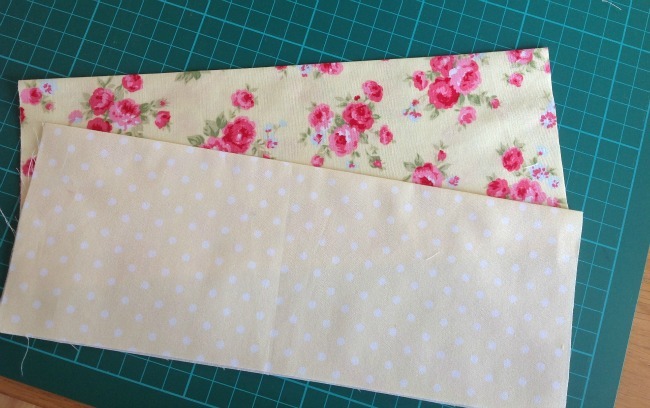 On the pocket, trim the corners. Fold ¼" and press. Sew a seam on one long edge. This will be the opening at the top of the pocket. 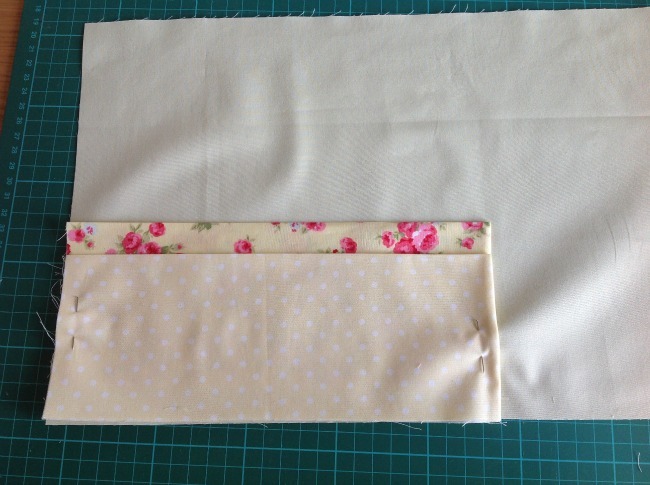 Place the 2 pouches onto the lining fabric and pin. 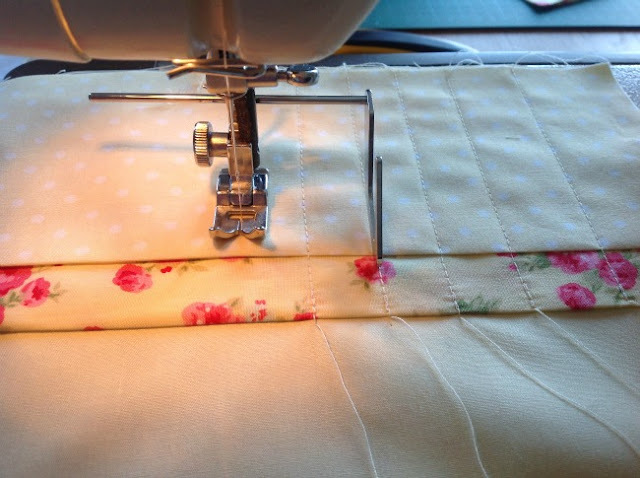 Ensure the sewn edge is to the right and the raw edge to the left. Top stitch 7 straight lines ¾" apart starting at the raw edge. This makes the pockets for the crochet hooks. 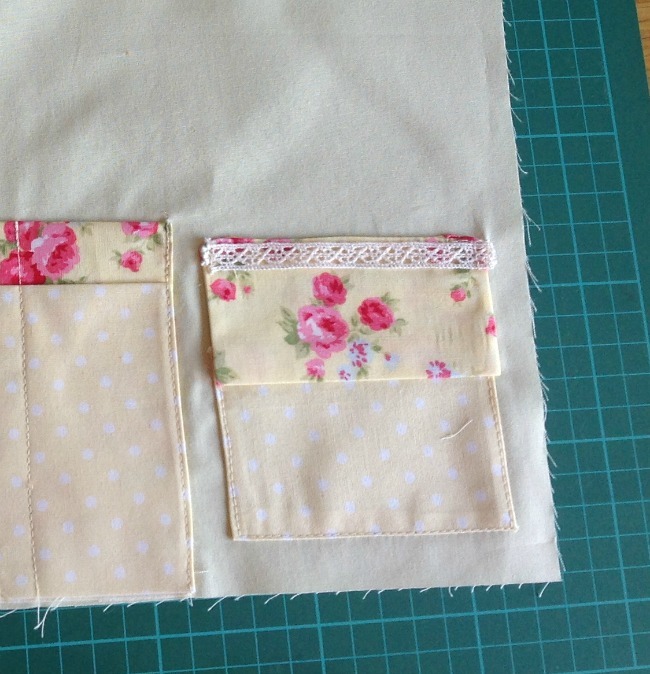 Only sew to the top of the pouch. 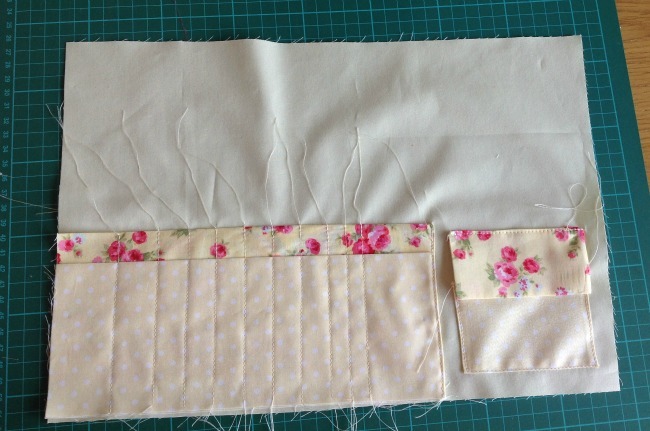 The 8th line of sewing will be very close to the finished edge. this makes a larger pocket for scissors. 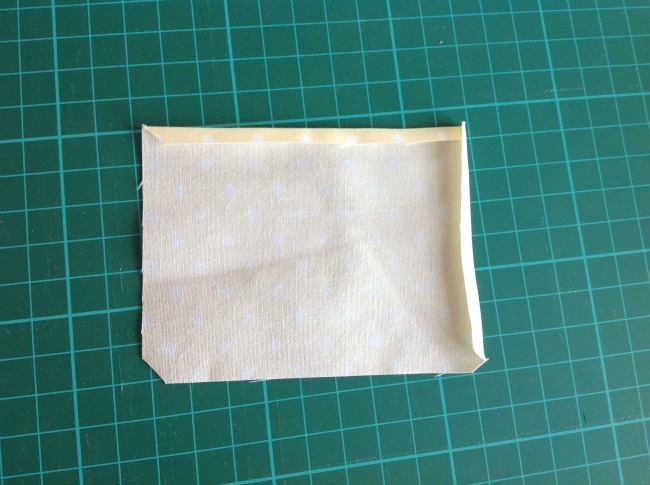 I used a guide but you could draw lines using a vanishing fabric marker. 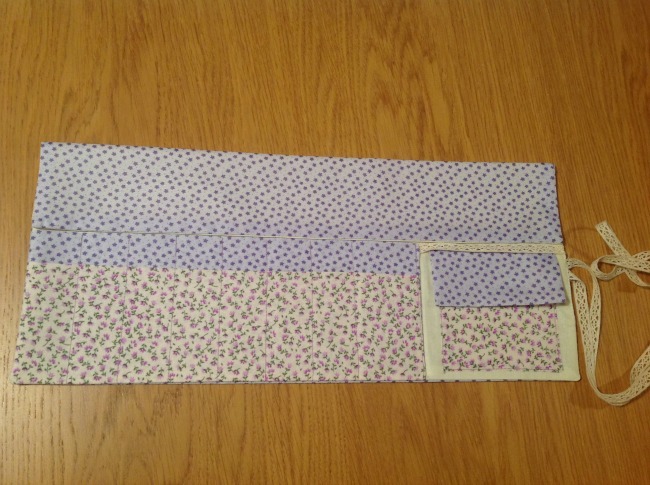 Place the pocket and and sew in place on three sides. Make reinforcement for the button. Cut a circle of fabric and place where you are going to put the button. The best place is where the ribbon will be inserted. 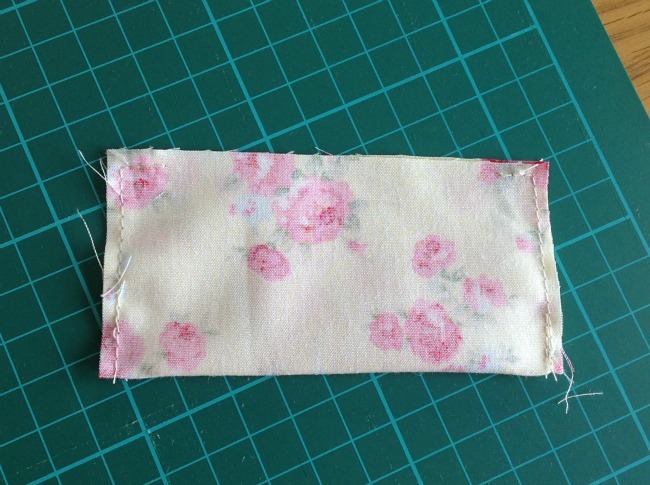 Sew button into place through the circle of fabric. 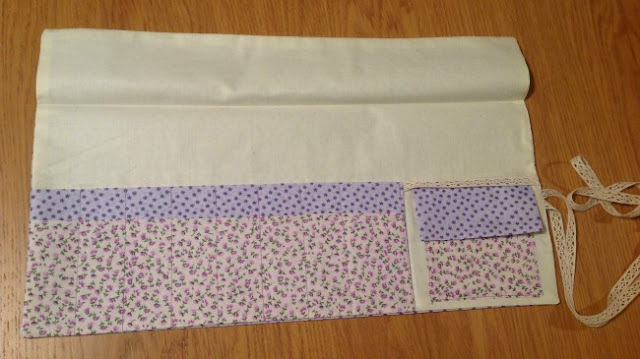 Place lining and outside fabric right sides together. Sew three sides and on the fourth leave a gap of about 3" so it can be turned the right way. 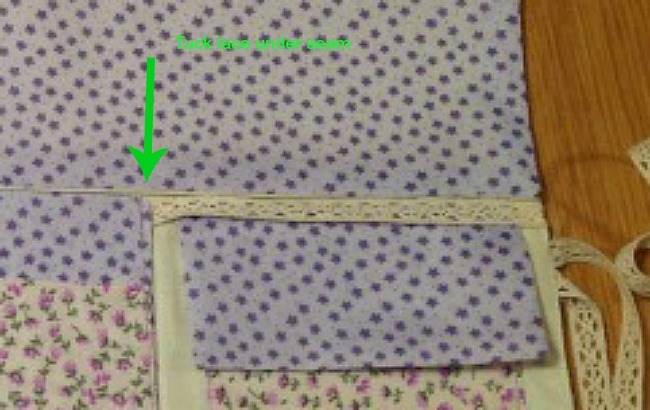 Ensure the lace/ribbon for the row markers is flat and is caught in the side seam. Cut across the corners. Turn right side out. Push corners with something pointy and press. 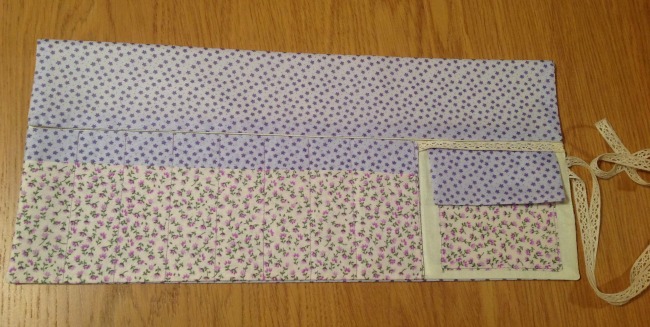 Make sure the opening has the edges turned in to match the seam. Fold ribbon/lace in half and insert folded end into gap. Top stitch the opening closed. 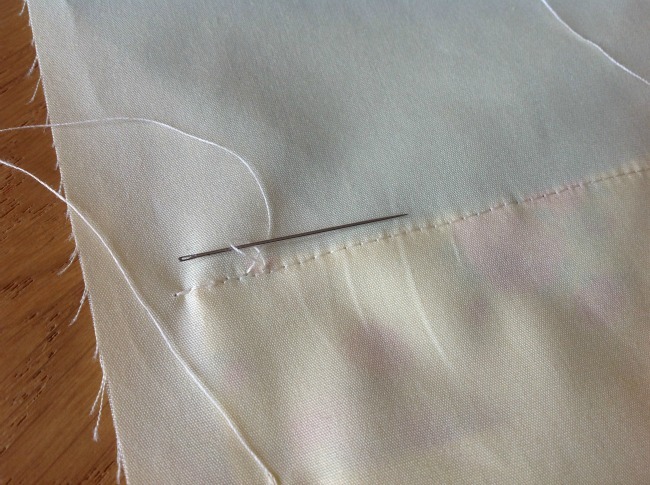 On my practice piece I put the button away from the edge but it is better closer to the ribbon. 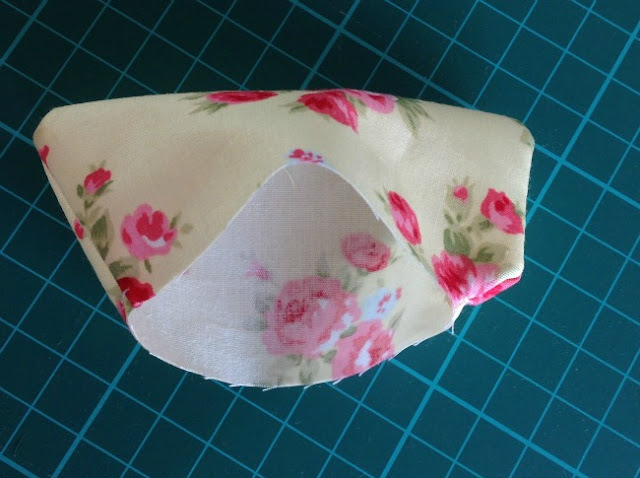 Fold over the top. Press, fill with your hooks and roll up! 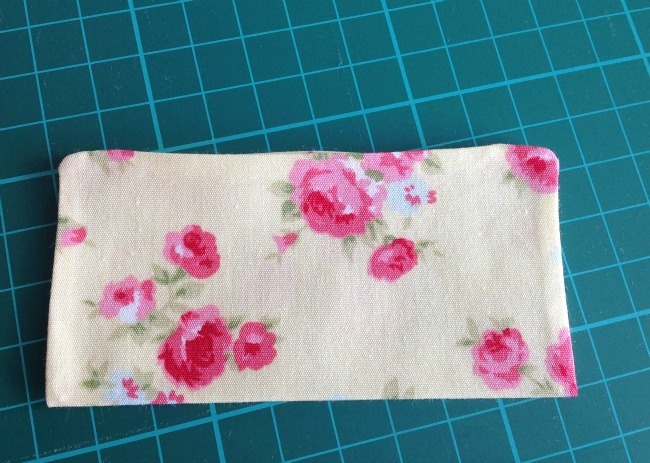 Pretty fabric from The Works. 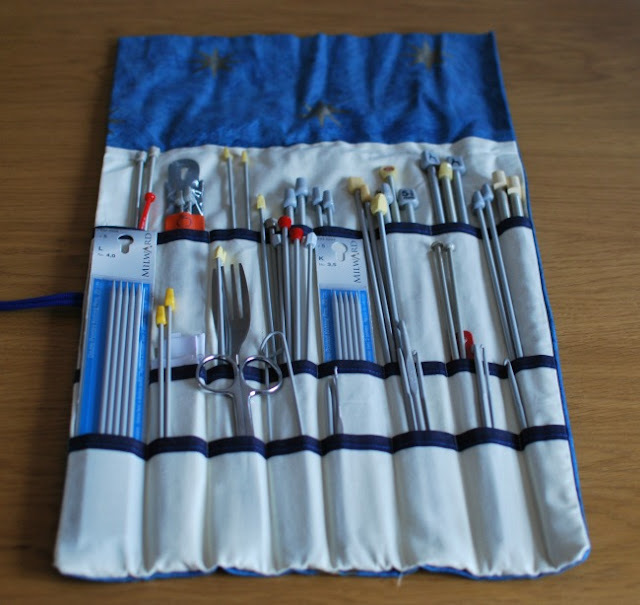 It can easily be adapted to hold knitting needles. This one I made years ago has an extra pouch and holds all my needles and hooks. My original, full to bursting! I didn't put a button on, just used a shoe lace and tucked it in. Please let me know if you make one, I'd love to see your finished project.